There are several factors that can contribute to sleep quality, and sheets are one of them. Finding the right sheets for you can be a bit of a process. When evaluating sheets, you should take into account construction and build, weave preferences, durability, coolness, and how you feel when you sleep on them. Of course, these things can be difficult (or impossible) to evaluate before you have a chance to actually sleep on a set of sheets. Here at Sleepopolis, I do some of the hard work for you. In today’s review, I take a look at the Cariloha bamboo sheets and determine whether they’re worth your time and money. Don’t need to know all the nitty gritty? No problem. Click here to head straight to the review summary. The Cariloha bamboo sheets are made from 100% viscose from bamboo with a twill weave construction. According to the manufacturer, these bamboo sheets are two times as soft as regular cotton sheets. Each set of Cariloha bamboo sheets comes with one fitted sheet, one flat sheet, and two pillow cases. The Cariloha bamboo sheets are available for queen and king-sized mattresses and fit mattresses up to 18” deep. The pillow cases are designed to fit pillows measuring 20” x 28” (queen sheet set) and 20” x 36” (king sheet set). Overall, the Cariloha bamboo sheets have a fairly good build quality. This was determined by closely examining the stitching, material quality, and overall construction. Upon examination, I did find some loose threads after washing the Cariloha bamboo sheets, though most of these could be easily clipped without compromising sheet integrity. In a few places, there was some crooked or doubled stitching, a fact that surprised me at this price point. 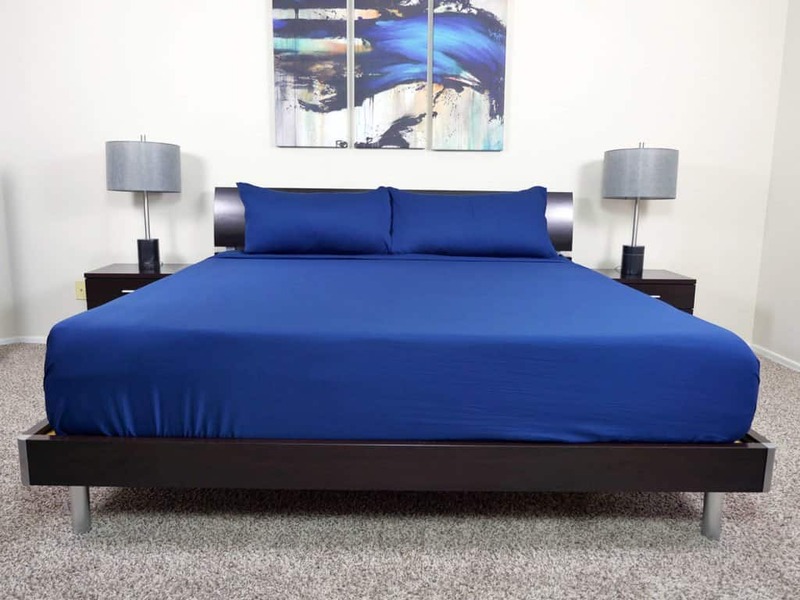 However, given the fact these sheets are softer and not as tough as sheets constructed from stronger materials, some loose threads are to be expected. When testing the Cariloha bamboo sheets, I keyed in on three main points: shrinkage, damage, and color. There’s almost nothing more frustrating than spending good money on a set of sheets only to have them shrink after normal laundering. So I tested how well the Cariloha bamboo sheets stayed true to size. Next, I once again inspected any loose threads after numerous wash / dry cycles to determine how well the Cariloha bamboo sheets stood the test of time. Finally, I wanted to see if the sheets would hold their deep blue color, so I test color hold as well. In order to determine whether the Cariloha bamboo sheets shrink after normal washing and drying, I measured the flat and fitted sheets as well as the pillow cases. I took measurements both before the sheets were placed in the washer and after they were removed from the dryer. Then, I did a little math to determine how much the sheets shrank. 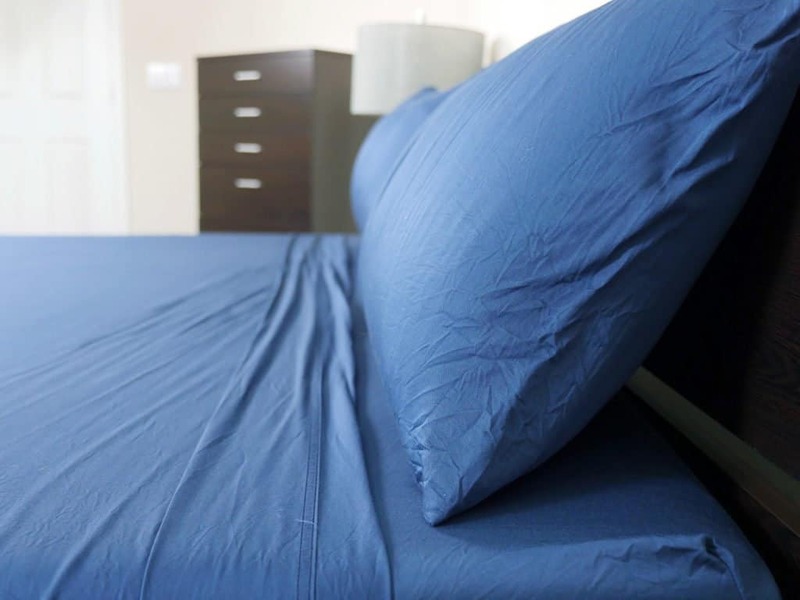 After further review, the flat sheet shrank by 2.8% compared to its original size. The pillow case saw a little more shrinkage, decreasing in size by 4.2%. Cariloha Bamboo Sheets Shrinkage – flat sheet shrank by 2.8%. 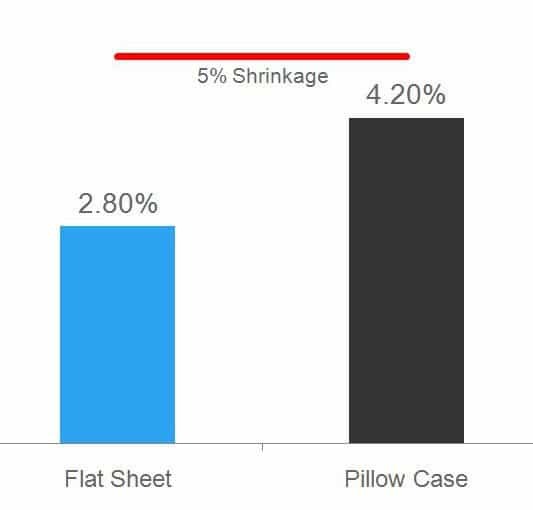 Pillow case shrank by 4.2%. 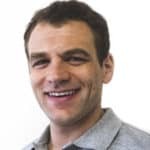 Sometimes damage occurs over several wash / dry cycles, so it’s important to test that. After further review, the Cariloha sheets seem to have held up very well. This was great to see, especially given the number of loose threads I identified out of the package. After several wash / dry cycles and weeks of use there were no new loose threads and the preexisting threads did not become any worse. The color test I devised demonstrates whether a set of sheets has any color or dye run off. I begin by soaking a pillowcase in warm water and allowing it to absorb. Next, I ring out excess water with my hands and place a layer of paper towels under the pillow case. Finally, I press a rolling pin against the pillow case and check whether there is any color run off on the paper towels. Once this test was completed, I was able to note that these sheets did not show any sort of color / dye run off. Cariloha bamboo sheets are primarily known for their softness. They truly do deliver in that department. I sank into these sheets and they glided over my body whenever I readjusted throughout the night. The softness did make the sheets slightly slippery, but not quite as much as sateen sheets. One of the best things about the Cariloha bamboo sheets is their cooling effect. These sheets are touted as “3 degrees cooler than cotton sheets”. While I’m not certain they are exactly 3 degrees cooler, I can say that they do have a cool feel and sleep extremely comfortable. Compared to most cotton sheets I agree, that they do feel cooler. The almost silky smooth feel helps in this department as well, as the sheets don’t stick or otherwise hold to your skin. The Cariloha bamboo sheets are available in a variety of colors – from Bahama Blue (the color of the sheets I reviewed) to white, ivory, sage, and sandy shore. 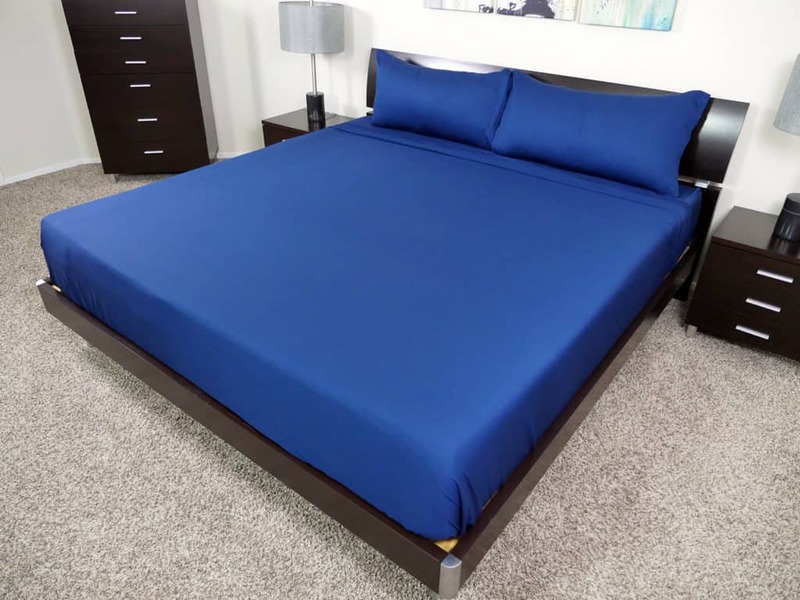 All the sheets are solid colors with no patterns or other styles available. Finally, the sheets didn’t wrinkle as bad as other sheets I’ve tried, but even removing them from the dryer when they were still damp and air drying them did not prevent all of the wrinkles. Should I buy the Cariloha Bamboo sheets? Want silky soft smooth sheets – Made from viscose from bamboo, these sheets deliver an incredible softness. It’s a smooth type of a feel, similar to a sateen weave in some respects. This type of a feel helps to improve cooling, as the sheets don’t cling to your skin. Want eco-friendly sheets – Bamboo is a sustainable material, so sheets made from it are a great choice to help the environment. Want a cool feel – With natural moisture wicking, these sheets help you stay cool throughout the night, no matter what climate you live in. I tested these at the end of the Phoenix, Arizona summer and and found them to be quite comfortable. As mentioned above, the smooth feel of the bamboo really helps these sheets to glide across your skin. Find out more about Cariloha bamboo sheets at Amazon.com. The Cariloha bamboo sheets are silky soft and have a cool to the touch feel. The smoothness of these sheets allow them to almost glide across your skin, aiding in cooling and moisture wicking. The viscose from bamboo material construction also means they are eco-friendly. At $179 for a Queen set they certainly aren’t the cheapest, but as far as bamboo sheets go it’s a pretty solid value and a good overall set.